Now that we have a better understanding of how the Galaxy S8’s two SoC options perform, it’s time to see how well the S8’s hardware and software work together. To evaluate overall system performance, we turn to the PCMark Work 2.0 suite, which tests the combined effects of the CPU, GPU, RAM, and NAND storage. Because it uses standard Android API calls and runs several different real-world workloads that elicit realistic behavior from the CPU governor (unlike synthetic tests that simply run one or more CPUs at max frequency), it’s a good indicator of everyday performance. Right away we see a very noticeable difference in overall performance between the two different S8 versions. 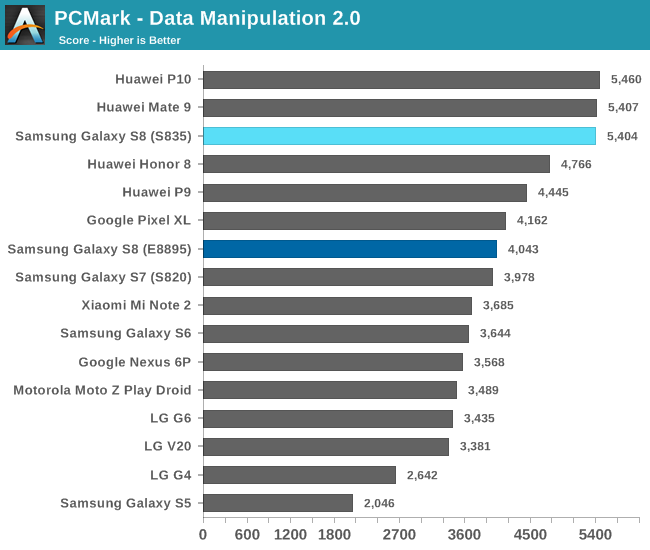 The S8 with Snapdragon 835 tops the chart, scoring better than the previous champion, the Huawei Mate 9, and outpacing the Exynos 8895 version by 29%. Not only is the E8895 S8 slower than its brother, it also fares no better overall than the older Galaxy S7 (S820). 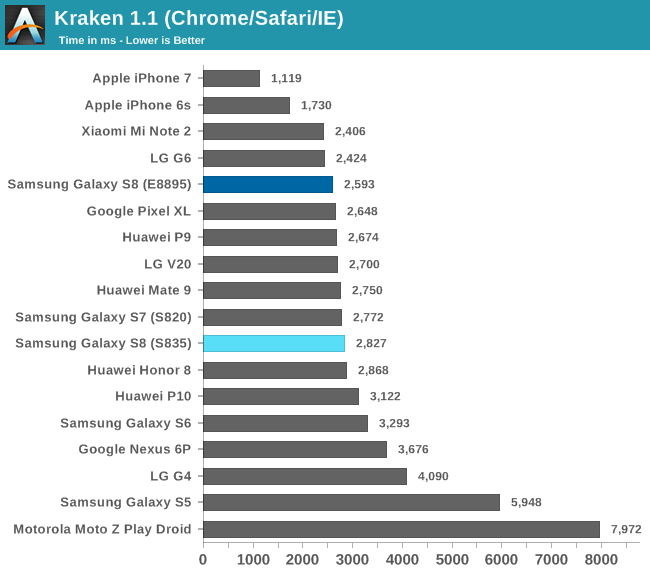 Both S8’s are faster than the Galaxy S6, however, with the S835 version scoring 48% better overall and the E8895 version squeaking past with a 15% margin. Compared to the Galaxy S5 and its S801 SoC, the S8 is 100% and 55% faster, respectively. 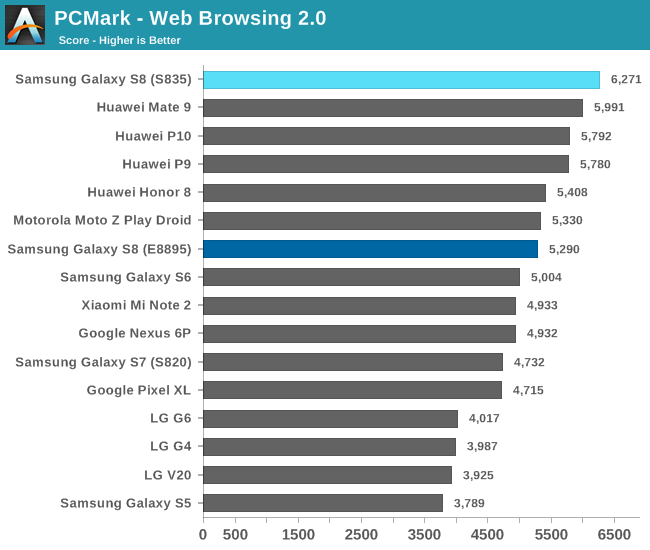 In the Web Browsing test, the hierarchy at the top half of the chart is largely the same, although the performance deltas are less than what we saw for the overall PCMark scores. 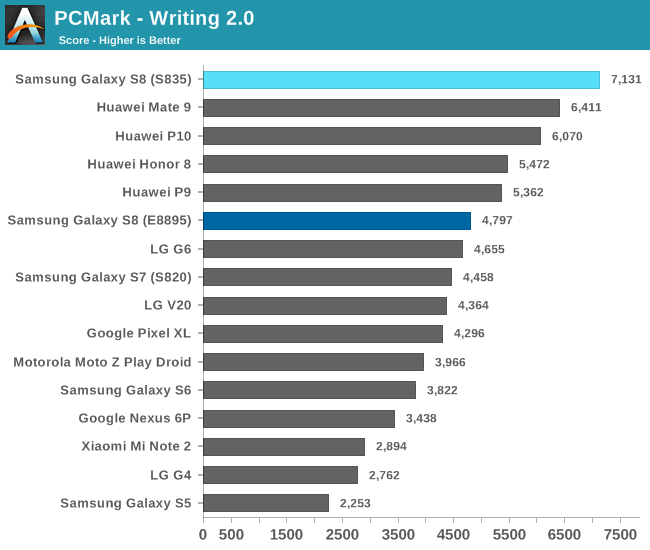 The S835 S8 claims the top spot once again and outperforms its E8895 counterpart by 19%. The Galaxy S8 (S835) and Galaxy S5 bracket the results, with the former showing a 66% advantage. The Exynos S8 is a little slower than the Snapdragon version (19%), but is at least faster than all the previous Galaxy phones by as much as 40% relative to the S5. 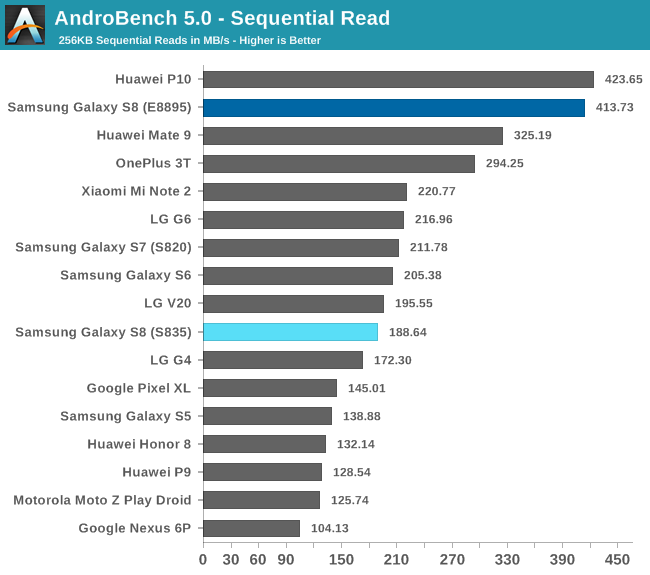 LG phones typically do not perform as well in this test because threads spend more time running on the lower-performing A53 or efficiency CPU cores compared to other phones, presumably a deliberate decision by LG to reduce power consumption. 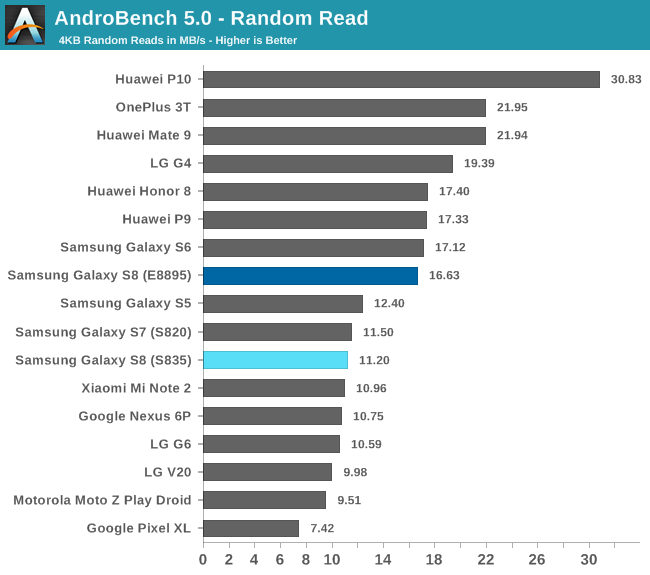 The Galaxy S8 (S835) delivers the best performance in the Writing test, whose workload elicits frequent, short bursts of activity from the big CPU cores. Our previous testing showed little difference in integer IPC between the S8’s two SoCs, but the S835 model performs 49% better than the S8 with E8895. The primary difference between the two models is how the scheduler migrates threads between the small and big CPU clusters. With the E8895, Samsung is a bit more conservative with moving threads onto the M2 cores. Both S8s are faster than the LG G6 and all the phones using a Snapdragon 820 SoC, though. The S8 is also between 2x and 3x faster than the Galaxy S5. The Video Editing test’s workload is not very strenuous, so we do not see much performance variation; however, the Photo Editing test, which applies a number of different photo effects and filters using both the CPU and GPU, shows more interesting results. Qualcomm’s Adreno GPUs stand out here by combining strong ALU performance with driver optimizations. 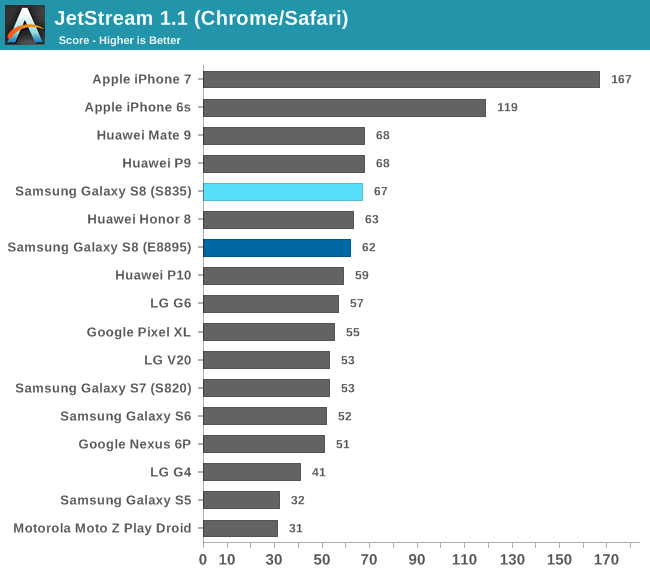 The Galaxy S8 (S835) sits among the phones using S820/S821 at the top of our chart, all sitting above the Mate 9, which is the first phone in this group to use an ARM Mali GPU. 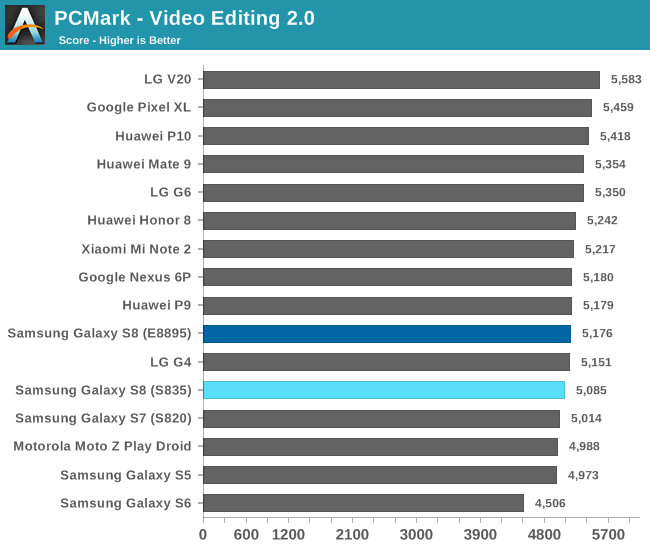 Compared to the E8895 model, the S8 (S835) performs 56% better. Curiously, the S8 (E8895) and its 20-core Mali-G71 GPU is considerably slower than the Mate 9’s 8-core Mali-G71 when running this workload. * Note: The OnePlus 3T and Huawei P10 may be using an unpatched version of the F2FS filesystem that artificially inflates write performance. It’s common to source NAND from multiple vendors, a practice forced into the spotlight this year with NAND chips in short supply. Earlier this year, Huawei took some heat after customers began complaining of poor storage performance in its top-tier Mate 9 and P10 phones. Huawei admitted that it was using lower-performing components due to supply shortfalls, with some customers claiming they received eMMC NAND instead of UFS. Unfortunately, even Samsung, which is one of the major NAND suppliers, is not immune to this dilemma, sourcing NAND from at least two suppliers for the Galaxy S8. Our E8895 S8 uses Samsung UFS 2.1 NAND and performs about 2x faster in the sequential read and write tests than our S835 S8 that uses UFS 2.0 NAND from Toshiba. 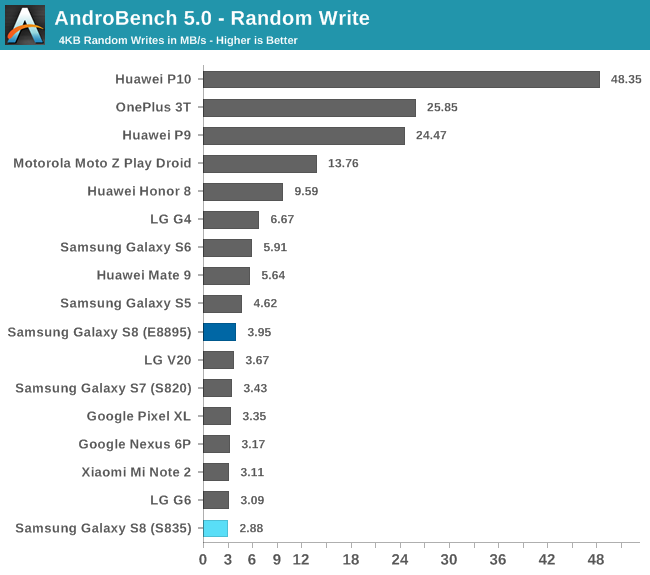 The S8’s (S835) write performance, both sequential and random, is particularly poor. 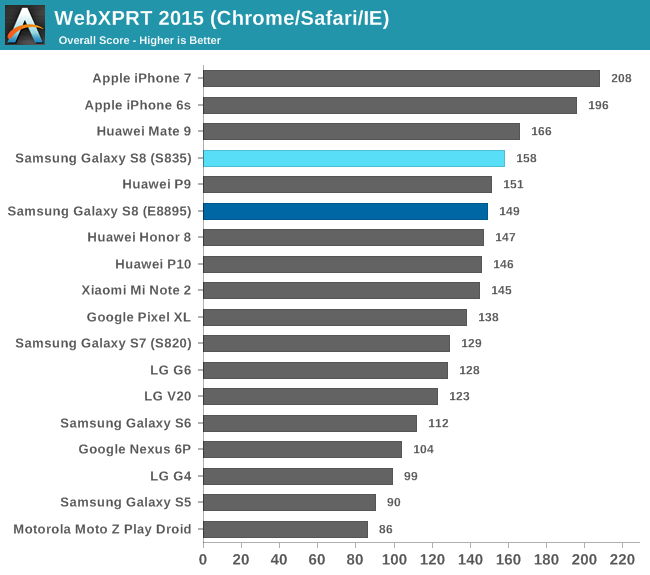 This is not necessarily a deal breaker, however, because read performance has a greater impact on user experience. 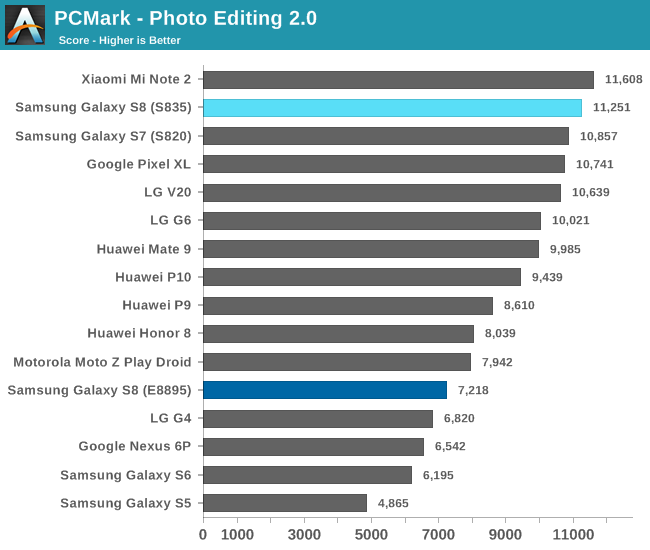 * Note: The Huawei P10 write values are crossed out because they likely are not accurate. The table above shows how storage performance scales with larger IO sizes. While the values we use in our general tests above represent the most common IO sizes, other workloads, notably accessing media files like photos and video, will utilize larger IO transfers, so it’s important to see how a phone performs over a wider range of scenarios. Throughput generally increases with IO size, and this is certainly true for the S8 (E8895), whose sequential read speed reaches 674 MB/s for 2 MB transfers, surpassing even the speedy P10. 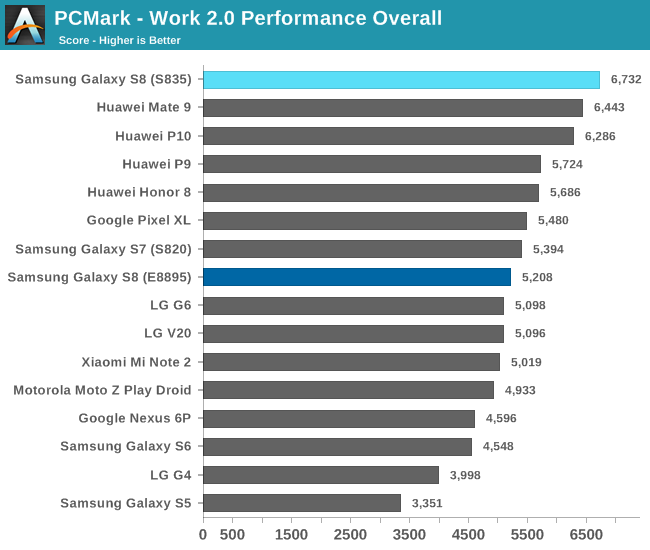 Performance for the S8 (S835) scales too, but its write performance remains consistently lower than other flagships; however, at larger IO sizes its throughput surpasses the Galaxy S7 (S820) when reading from storage. The Galaxy S8 performs well overall, but isn't consistently leading the pack and thus unable to cleanly establish itself as the premiere flagship in terms of everyday performance. 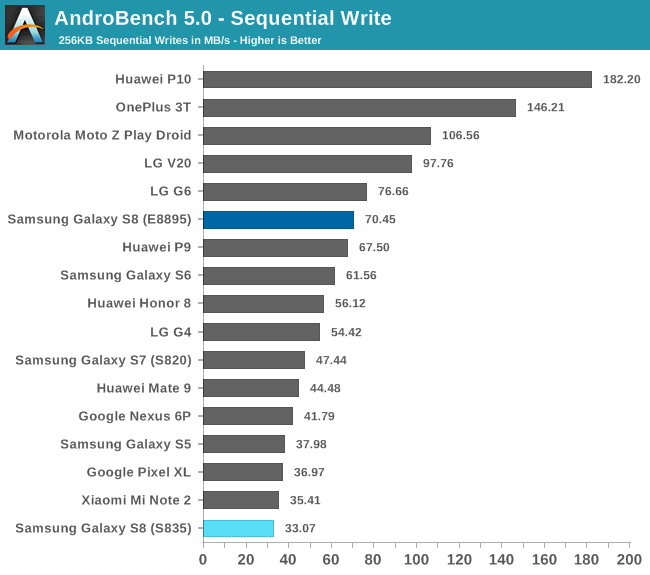 The S835 model, despite its poor write performance, is clearly the faster of the two models when using real-world apps. I did not have much of an opportunity to use the E8895 S8 since it was a time-limited loaner, but the user interface of the S835 model remains quite fluid while swiping and scrolling through the home screen, app drawer, recent apps menu, Edge panel, and browser. The S8 (S835) is the fastest and most fluid feeling Galaxy phone I’ve ever used. Not sure that Samsung (equity and assets roughly 1.5x Apple) is in any danger of being killed off by Apple, tbh. Nor HTC, LG, Huawei, or especially Google. Yep exactly, I tried an iPhone with the 6s+ but I couldnt stand it. Sure it was smoother than my Samsung phones, but no wireless charging, LCD screen looks like garbage after using OLED, no Always on Display for my night time clock, way too bulky, and there is no back button. That lack of back button was the real dealbreaker. The whole Apple input setup, having to constantly go to the home screen, it was just so annoying.